WOW!!! That's all I can say right now. The President of the United States Barack Obama just won the Nobel Peace Prize. He has been bestowed this prestigious honor because of "his extraordinary efforts to strengthen international diplomacy and cooperation between peoples." Despite my disappointments with the president's constant resistance to addresing LGBT issues I'm still proud of this prestigious accomplishment. Is it possible to simultaneously proud and disappointed? That is seriously how I feel about the Obama. 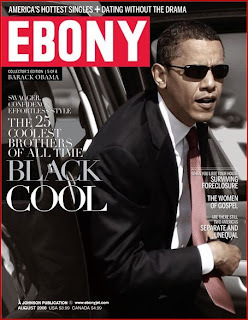 The first African-American president. Proud. Failure to repeal Don't Ask, Don't Tell. Disappointed. Winning the Nobel Peace Prize. Proud. Failure to end the Defense of Marriage Act. Disappointed. Carrying himself as an intelligent, sophisticated, articulate well-rounded family man. Proud. Remaining silent as hate crimes and employment discrimination against the LGBT community continues to rise. Disappointed. At this moment I'm proud. But then again I haven't heard the CNN interview with Pam Spaulding that happened earlier tonight. I'm sure upon seeing it I'll be wearing a frown again. But for now I'll just put on my blinders and be happy for a moment. The picture above is one of my favorite photos of our president. On this one I don't really agree with you 100%. I think its great that he got the Nobel, that said, I'm more uncomfortable with the fact that he got it this quick and was nominated in February, without having done all that much, other than promises. As for what he has or has not done on gay issues, I stand firm in the belief that he will honor his word. These things are not going to happen over night, just like ending those two wars, lowering unemployment, which among black men is now almost 30%. I'm a black gay man, but, also a realist on how things work in DC and the one thing that he can do first and foremost for me is to sign ENDA, that affects the lives of more in the glbt community than anything else IMO of course. I guess I've been turned off by the so called mainstream "gay bloggers" and media on all issues glbt, and, Lord knows I hope they don't act up in DC like they and their posters have been online, if they do, its just going to turn ugly and will be two or three steps backwards for equality. Beat Down Over a Dress Code!! !